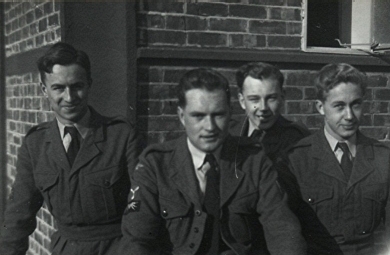 Usually playing on Wednesday afternoons, suitable opposition for this doughty bunch was provided by other military establishments together with certain local sides, and the RAF lads were victorious in 50% of the matches. Seven members of the team were chosen for an IW combined Services side. 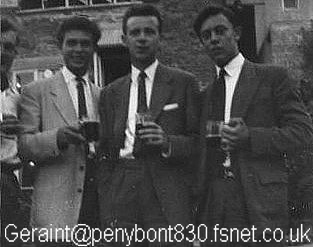 Taken in May 1955, this snap shows a slightly straight-faced group from Hut 28a, and it consists of Geraint on the left, Ron McIntyre, Ian Bradford and Peter Carpenter. Do they seem to be slightly impatient at having to pose for the photographer? Perhaps he was delaying them from the gastronomic delights of the cookhouse, or perhaps they were anxious to be away on duty? We did all so love our work you know. Or was that hint of exasparation merely due to the sun being in their eyes? 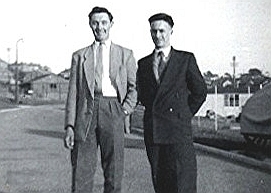 Ron now lives in Perth, sadly Ian is no longer in the land of the living, and Peter's whereabouts are presently unknown. The two posing here in their finery are Malcolm Gingell and Geraint. They have their backs to the Camp's main gate, and the white building behind them is I believe, the diminutive Station Sick Quarters. So where were this pair off to then? Well it could have been to a session of elbow exercise at the Prince of Wales, but it could also have been to the Winter Gardens, or the Sandown Trouville for the Saturday dances. Or perhaps it was away to a rehearsal of the Mikado - see next photo. 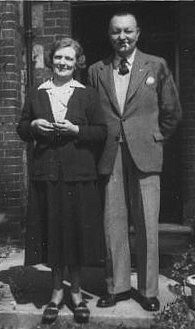 But it wasn't only a life of unadulterated hedonism at Ventnor you should understand: if it was a Sunday, this pair may might well have been off to Church. 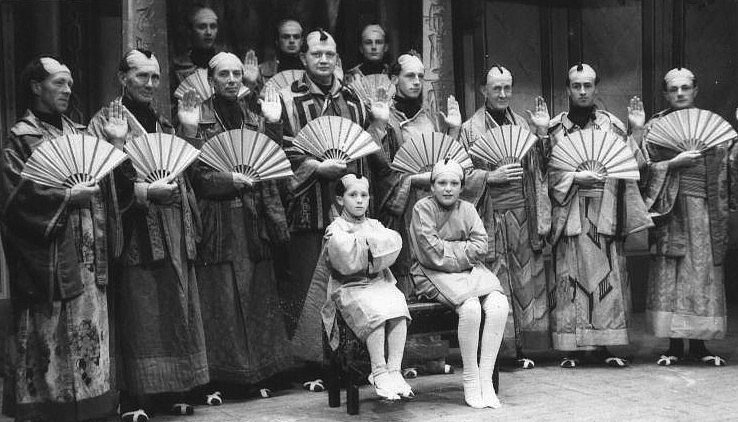 No less than six of these resplendent 'Gentlemen of Japan' performing in the 1955 production of 'The Mikado' by the Ventnor Amateur Dramatic & Musical Society were from the RAF. 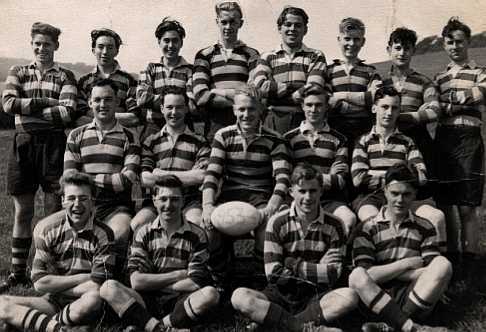 In the back row is Malcolm Gingell, Derek Simon, and Ian Bradford. To the right in the front John Quaterman, Geraint Hughes and Harry Evans. It seems that a group of RAF Ventnorians were posted to Hope Cove. In this shot taken there we have half of Harry Evans (from Southampton), Brian Penders (London), 'Flash' Johnstone (Norwich) and Cliff Jones (Rhondda). Geraint concludes his album with this Ventnor couple who lived at 'Clarendon', Zig Zag Road. Geraint reports them merely as being 'very kind' to him and other RAF lads. That undoubted understatement surely speaks volumes about the kindness of Ventnor people and the good relationship that existed between the town and the RAF personnel. Geraint may be contacted at the address on the above photo.